I am crazy in love with blushes. I have bought the crazy expensive ones, but honestly, my favorites are all drugstore. I seriously own every one of these and use them quite often! NYX Baked Blush in Foreplay - This is my newest obsession. For some reason I can't find it on the NYX website, but I found it at my local CVS & online at Ulta. It's so awesome. Great color payout, beautiful shade (perfect for Spring & Summer) and blends amazingly! Maybelline Dream Bouncy Blush in Rose Petal - This is my go to blush for beach days. I love a cream blush at the beach because it stays on much longer. I get the lightest color they have to make it look more natural and sun kissed. Physicians Formula Happy Booster in Natural - I love all the different mixes of color to make one beautiful and gorgeous blended blush. I love all things Physicians Formula and this is definitely one of my favorites. Elf Blush/Bronzer Combo in St. Lucia - This is something I have bought over and over. I love the blush, the bronzer is a little too warm for me, but it works better when I'm tanned. Either way, it's literally $3!! And it is awesome!! 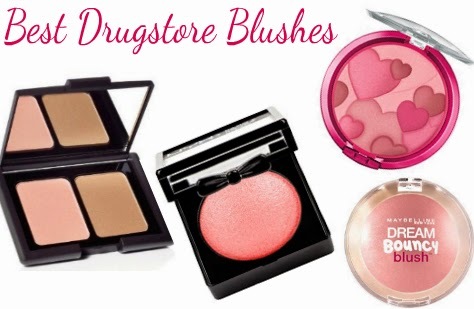 Make sure and check out my favorite drugstore bronzers, just in time for Spring!